The President's participation in a user-driven Q&A was a notable precedent in digital democracy. President Obama made some news in the process, with respect to the Supreme Court decision that allowed super political action committees, or “Super PACs,” to become part of the campaign finance landscape. 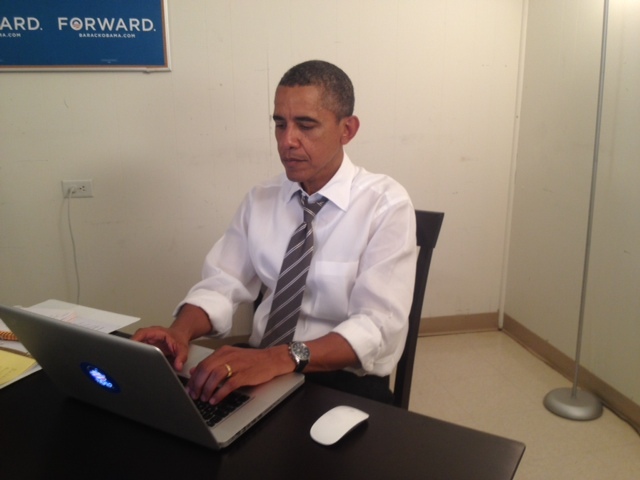 President Obama announced that he’d be participating in the AMA in a tweet and provided photographic evidence that he was actually answering questions in an image posted to Reddit (above) and in a second tweet during the session. The timing of the AMA was at least a little political, coming after a speech in Virginia and falling upon the third day of the Republic National Convention, but it is unequivocally a first, in terms of a president directly engaging with the vibrant Reddit community. Today’s AMA is only the latest example of presidents experimenting with online platforms, from President Clinton and President Bush posting text on WhiteHouse.gov to President Obama joining rebooting that platform on Drupal. More recently, President Obama has participated in a series of online ‘town halls’ using social media, including Twitter, Facebook, LinkedIn and the first presidential Hangout on Google+. His use of all them deserves to be analyzed critically, in terms of whether the platforms and events were being used to shine the credential of a tech-savvy chief executive in an election year or to genuinely answer the questions and concerns of the citizens he serves. In analyzing the success of such experiments in digital democracy, it’s worth looking at whether the questions answered were based upon the ones most citizens wanted to see asked (on Reddit, counted by upvotes) and whether the answers given were rehashed talking points or specific to the intent of the questions asked. On the first part of that rubric, President Obama scored high: he answered each of the top-voted questions in the AMA, along with a few personal ones. A step forward for digital democracy? The most interesting aspect of that Presidential Hangout was that it introduced the possibility of unscripted moments, where a citizen could ask an unexpected question, and the opportunity for followups, if an answer wasn’t specific enough. Reddit doesn’t provide quite the same mechanism for accountability at a live Hangout, in terms of putting an elected official on the spot to answer. Unfortunately, the platform of Reddit itself falls short here: there’s no way to force a politician to circle back and give a better answer, in the way, say, Mike Wallace might have on “60 Minutes.” That doesn’t mean that users of the platform can’t post good question, however — the query about campaign finance that made news was asked by Suzanne Merkelson, an associate editor at “The Republic Report.” Merkelsen, who has been covering the Republican National Convention in Tampa, moved quickly to pose her question on the AMA and saw some dividends from that entrepreneurial move. Much as many would like to believe that the medium determines the message, a modern politician is never unmediated. Not in a pie shop in Pennsylvania, not at a basketball game, not while having dinner, not on the phone with NASA, not on TV, not doing a Reddit AMA. Reddit is not a mic accidentally left on during a private moment. The kind of intimacy and honesty that Redditors crave does not scale up to national politics, where no one ever lets down his or her guard. Instead of using the stiffness and formality of the MSM to drive his message home, Obama simply used the looseness and casual banter of Reddit to drive his message home. Here more than in almost anything else: Tech is not the answer to the problems of modern politics. Today’s exchange, however, does hint at the tantalizing dynamic that makes it alluring: that the Internet is connecting you and your question to the most powerful man in the world, directly, and that your online community can push for him to answer it. Well, it’s a start. Thank you for logging on today, Mr. President. Please come back online and answer some more follow up questions. This post has been updated with more analysis and links.